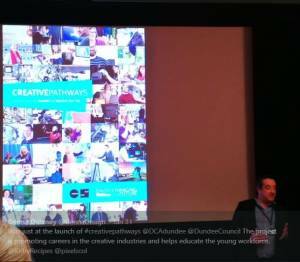 Ok, so you are probably wondering what is Creative Pathways? It’s a National Creative learning project, started in Dundee and is funded by Dundee City Council and Creative Scotland. It’s a project that I’m proud and feel privileged to be part of. The aim of the project is to promote the education of the young workforce and show them that there are many careers within the Creative Industries. Studying Art and Design or Tech Studies, does not mean you can only become an artist or crafts person. There are so many job opportunities. Including (but not limiting to), a graphic designer, a curator, a dancer, a writer, a teacher, the list goes on. The film showcases a selection of the creative talent in Dundee who are all successful in there specific niche and have created their own jobs. 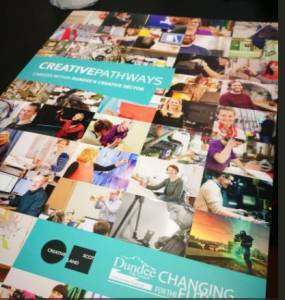 The project also includes a printed brochure, which features many creative people who are living and working in Dundee. So are you looking for a job in the creative industries? The creative pathways brochure will give you helpful advice and stories of how local people have created a creative career for themselves.